A brand new song from Kalank, titled First Class will be coming out today at 2 pm. Few hours to go for the track to release and Karan Johar took to social media to share some stills of Varun Dhawan and Kiara Advani from the song. The chemistry between Varun and Kiara looks 'first class' indeed! It's going to be a dhamakedar dance number and if these stills are anything to go by, Varun and Kiara will sure set our screens on fire with their kickass moves. Varun has impressed us mightily with his new look for Kalank. His intense kohl- eyes leave us wanting to know more about his fearless character - Zafar from the film. Kiara is in the film only for a dance number from what we're assuming. Ever since she started hanging out with Karan, the actress has become a part of his ilk. No wonder she's playing a major role in his next, Good News. Varun Dhawan Sends 'First Class' Holi Wishes By Teasing Fans With A Glimpse of Kalank's Second Song. Coming back to the dance number, it is sung by Arijit Singh. 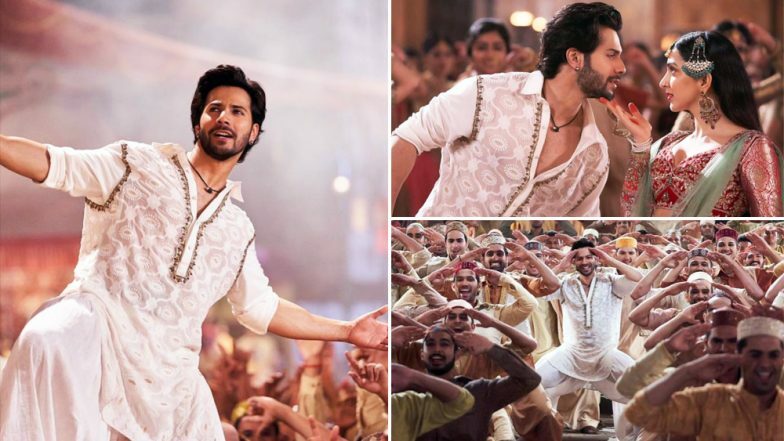 The first track from Kalank, Ghar More Pardesiya gave us very little of Varun Dhawan. There were only glimpses of the actor while the song revolved around Alia Bhatt and Madhuri Dixit, who by the way, looked spectacular together! However, now with First Class, looks like fans will get to see more of VD in the track. Are you excited to see Varun and Kiara matching steps? Comment below and tell us what you think of their pairing. The film also features Alia Bhatt, Sanjay Dutt, Madhuri Dixit, Sonakshi Sinha and Aditya Roy Kapur in pivotal roles. Helmed by Abhishek Varman, Kalank is based in the 1940s. Bankrolled by Karan Johar, Sajid Nadiadwala, and Fox Star Studios, Kalank is slated to release on April 17, 2019.